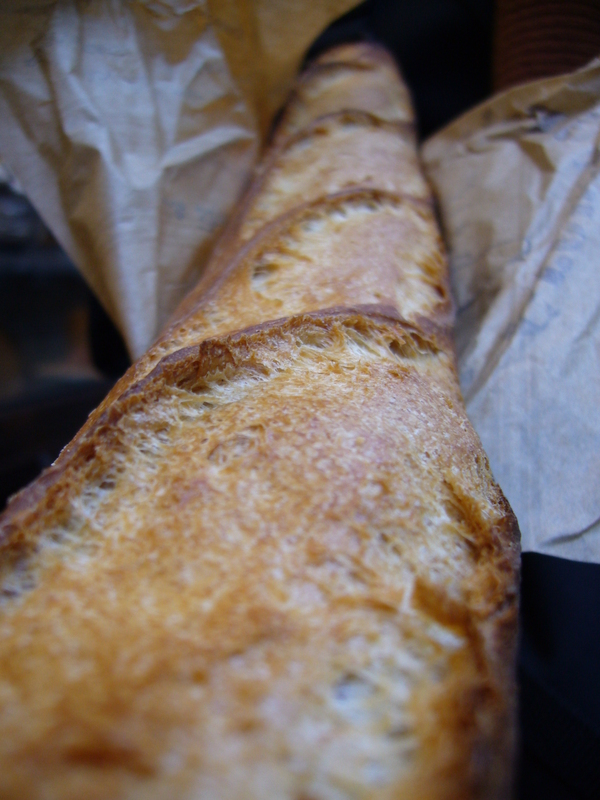 “Best” baguette in Paris | Home. ← Two posts in one: what I’ve learned, and my soapbox. When I was in Napa, working at Bouchon Bakery, I thought we had the best baguettes I had ever tasted and seen. The lunch baguettes, to me, were the most balanced – nutty, sweet and a hint of sourness (from the overnight fermentation). I was reassured we were the best repeatedly by regulars, tourists, and industry people. My only regret is that I didn’t try enough other baker’s baguettes. Perhaps it is like wine, where you end up developing a palate for the house wine. As a baker, it is important for me to try other baker’s breads. It’s not really for me to judge whether or not their baking styles are correct or the most refined. It is really for me to figure out what it is that I like (and dislike) – think of it as research. My preference is not always someone else’s preference – usually Justin and I clash on this account. This baguette tasting of Paris probably should have included more bakeries, but I only had 36 hours, limited stomach space, and had to work the bakery schedule around Justin’s planned meals. Justin would have said I didn’t have to come eat with him, but how could you pass up on the potentially 3 best meals of the near future? 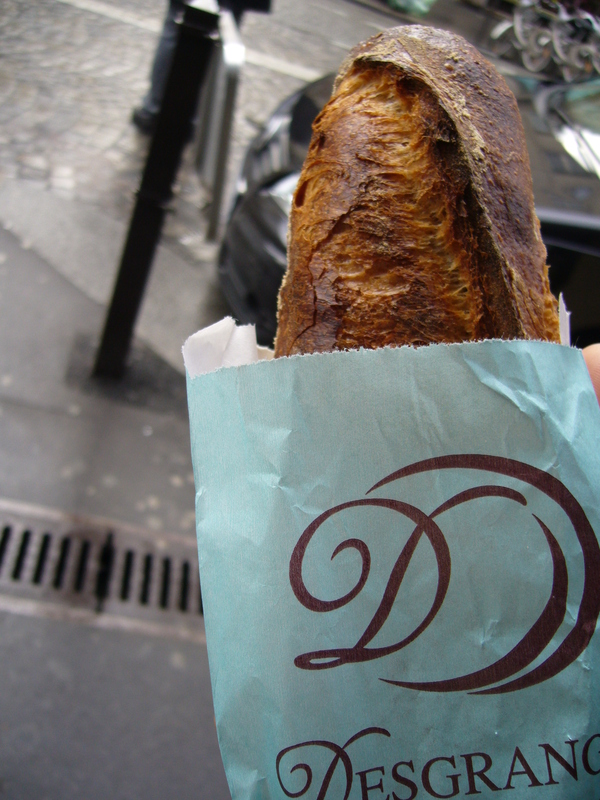 The best baguette in Paris can change on a daily basis. On this particular trip, spanning two days (Feb 2-3, 2011), there were two clear top-runners. It does not surprise me that the two I liked the most were in the top five of the 2010 Grand Prix de la Baguette in Paris. I judge the breads based on appearance, crust (how far it was baked), aroma, flavor and crumb. To get a proper sample of the crumb, I brought a serrated knife with me and hoped the security at Eurostar would let me through. 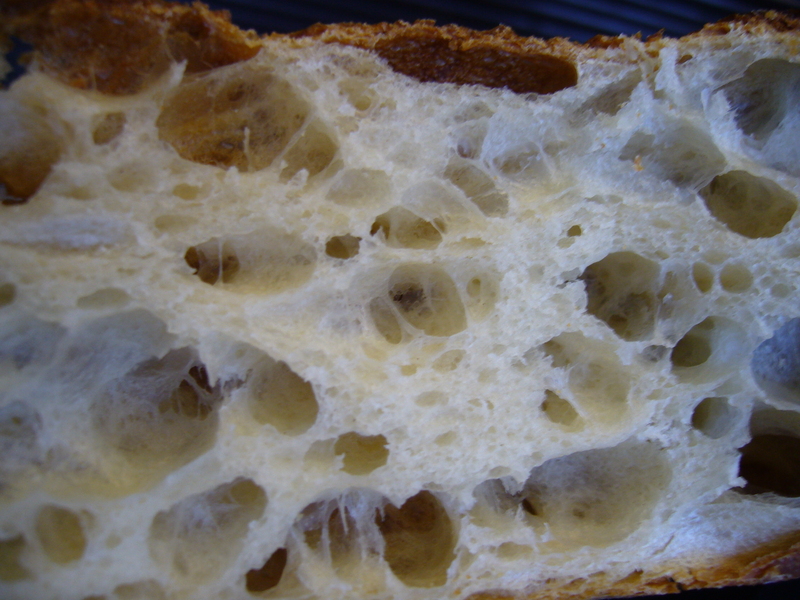 Eating a warm baguette may be nice, but you will not get the full effect of the preferment and flavor exchange from the Maillard reaction of the crust. Also, the crust will soften as you allow the bread to cool. I prefer a thin but noticeable crust with slightly black edges of the ears and a moist interior. Flavor is color and I appreciate bakers who are not afraid to go darker. Don’t be surprised if you find pale breads in Paris. I won’t even dare to eat that. I was recommended this bakery by Master Baker Jonathan Dendauw of the French Pastry School. Djibril Bodian, the Senegal-born baker of Le Grenier à Pain Abbesses, won the 2010 Grand Prix de la Baguette and received the honor of baking bread for the president of France for the year (and some nice pocket change). When we arrived in Paris on the 2nd, we went straight to the bakery – only to find that it was closed (apparently closed Tuesday and Wednesday). We purposely planned our Paris trip to not fall on a Sunday or Monday since many places close. Not willing to miss this opportunity, we went out of our way to try again on Thursday. The bakery alone – set up and quality of products – was the highest I had seen of Paris bakeries we walked past. Their focus was mainly breads, but still allowing the small selection of pastries to receive the same attention given to the breads. The baguette had a very nice sweet wheat flavor with a crisp crust that was thicker than thin but not too thick. I would go back every time I visit Paris. Desgranges’ baguettes had the wonderful aroma and flavor of a baguette made with a poolish – slightly nutty and sweet. 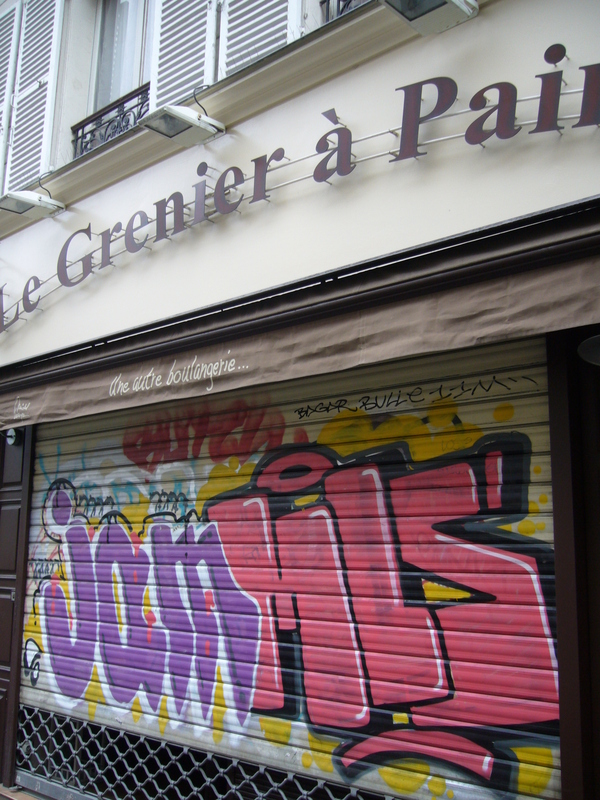 The scoring may not have been as precise as Le Grenier à Pain’s (nice even length scores); however, the way they scored it allowed for even expansion – the mark of a straight baguette. The crust was dark, just how I like it, but not too hard that it would be unpleasant to eat. The bakery was also a patisserie with a large selection of tarts, viennoiserie chocolate and cakes. All were made with a very high attention to detail. Other bakeries visited included Eric Kayser at Boulevard du Montparnasse, Gosselin and Anis Bouabsa at Au Duc de la Chapelle. 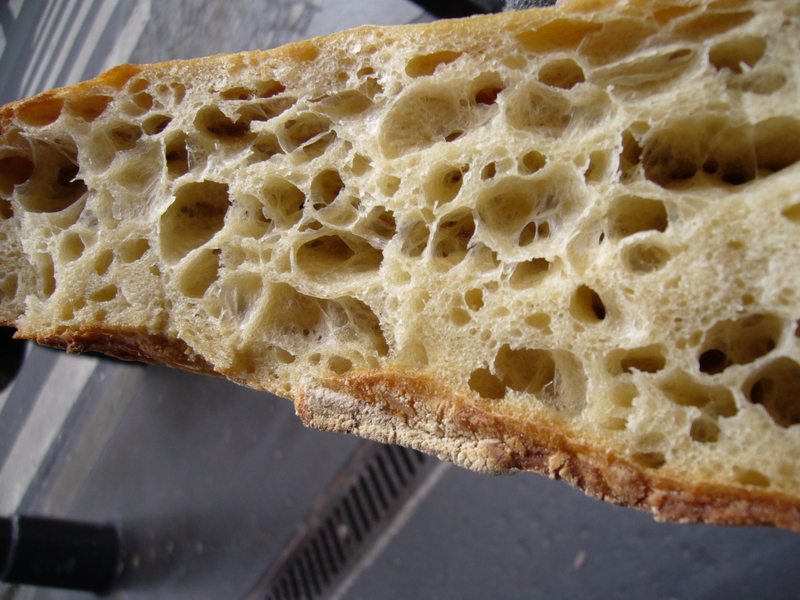 Eric Kayser’s bakeries are known for only using a sourdough levain to leaven their breads. This yielded a baguette with a nice, perfectly balanced sour profile. The crust was nice and thin. There was also a large selection of pastry items that looked good, but not great. At Gosselin, (258 boulevard Saint Germain, 75007) the baguette was lacking flavor, but had a nice thin crust. A really nice, chic, modern storefront with fresh crepes made under your nose. Anis Bouabsa at Au Duc de la Chapelle (32 rue Tristan Tzara, 75018) was perhaps the most disappointing of all. The crumb was really tight, more white than creamy, and I refused to take a bite. Maybe it was the day, maybe it was the chef not being there, but I hate making excuses for such high expectations. One shouldn’t make a nice baguette for only special occasions. Apparently this isn’t the only top 5 that has gotten a nod of disappointment. Cotton-ball like fluff? There were many more bakeries I wanted to visit, but with a tight schedule and only 36 hours, my selections were limited. Next time, I definitely plan on trying Dominique Saibron of Macaron’s Café at 77 avenue du Général Leclerc, 75014 and Daniel Pouphary of La Parisienne at 28 rue Monge, 75005. Btw, the homeless gratefully accept half sampled baguettes. You are absolutely right about the variance in quality with baguettes but having said that I have to say that the range of the variance is far less than that in American and Australian breads. My greatest complaint, living in Hobart, Australia, is the inability to get a decent baguette (although there are some other exceptionally fine breads). Even in America, you have to break up the country into different areas. You can find really good bread with less variance in the San Fran Area. New York, Vegas, Seattle, Portland and DC also have good outlets for bread.